On 28 August 2013 at 18:03 UTC, a Delta IV-H with a classified NRO payload lifted off from Vandenberg AFB as NRO Launch 65 (NROL-65). It is widely believed that the payload is a KH-11/KH-12 Keyhole optical reconnaissance satellite. 1.5 hours after launch at the completion of its first orbit, the upper stage and the payload were seen by Cees Bassa from the Netherlands, Björn Gimle in Sweden, Alexander Repnoy in the Ukraine and Jon Mikel in Spain . The sky was still too bright in the western Netherlands during this pass. But on a second pass, three hours (two orbital revolutions) after launch, I captured the payload on photo and video when it made a fine near-Zenith pass over Leiden. It was faint, near mag. +4.5. Conditions were fair but not perfect: the sky was slightly hazy. 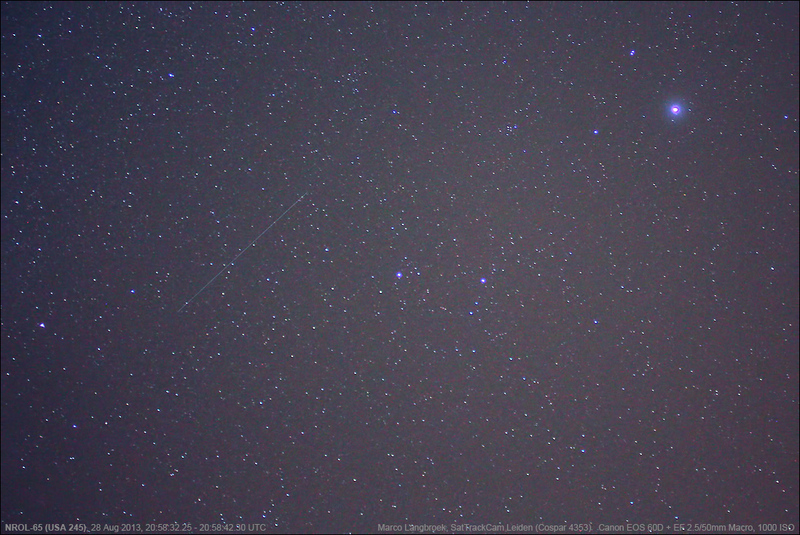 The image above shows it traversing Lyra - the bright star is Vega. The image was shot with the F2.5/50mm Macro lens. In the video below (with which YouTube unfortunately did not do a particularly good job, the original video is much better quality) shows it rising over the roof and passing near Altair, then shows a clip of it traversing Lyra. It was shot with the WATEC 902H and a 1.4/25mm lens. Russell Eberst in Scotland and Cees Bassa in the Netherlands captured it during the same pass as well. Since then, the payload (the upper stage has been deorbited after the first revolution) was also seen by Ted Molczan in Toronto, Canada and filmed by Kevin Fetter in Canada. Over the next few days, we will watch it finalizing its intended orbit. The orbital plane is the same as that of USA 186 (2005-042A), an earlier KH-11 launched in 2005. Both the photography and video yielded a set of positional data that along with observations by other observers helped Ted Molczan to define a preliminary orbit.